The negotiation of the commons is now taking place at full swing in two distinct realms that are increasingly reaching into and shaping one another: the long history of the landscape commons both in cities and in the countryside and in digital networks. In both realms we find the continued project of the Enclosures, appropriating forms of collectively created use value and converting it, wherever possible, into exchange value. Creative practices under capitalism have long contained elements of both creation and resistance (or defence), and now these actions, both positive and negative, take place across the digital and situated realms as well as what might now be termed the ‘situated digital’. A number of artists associated with the London-based activist digital arts collective Furtherfield have sought to embody, emplace, and perform ideas, people, and interactions that are at a distance or distributed across space and/or time as well as revealing the social relations that are produced by infrastructures for distribution and connection, including communication and information networks. 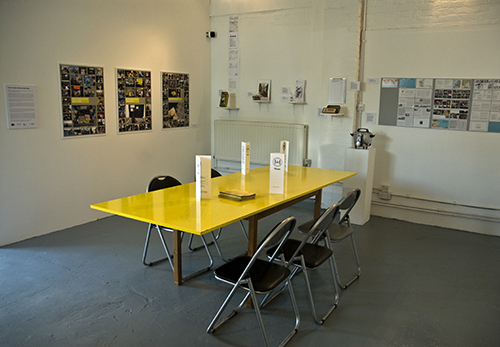 Furtherfield’s Do-It-With-Others (DIWO) ethos has always ensured that, although its primary expressions are digital and networked, that coming together at table over food and/or drink – commensality and propinquity – have been essential to ensure big steps forward in collective endeavour. It became a project to increase opportunities for this international ‘rich networking’ by seeking ways to reach into global ideas and associations by creating, through digital means, commensality without propinquity. This paper will explore the political and theoretical grounding of these efforts using case studies from projects of Furtherfield-associated artists involving networked food distribution and dining, including Pollie Barden’s ‘Telematic Dinner Parties’, Sophie Hope’s ‘1984’, and Kate Rich’s ‘Feral Trade Café’. This toast occurred between impromptu participants during an unannounced, live, two-way, television-satellite link between New York City, and Los Angeles. For three evenings in November 1980, people on opposite coasts of the U.S. appeared as life-sized, television images, standing right next to each other, able to hold a conversation. And so they discovered and invented possibilities for new encounters across a geographical divide. Hole-in-Space introduces possibilities for conviviality, sensuality, and feeling together, in the early creation of the digital commons. It is curious and telling that a clearly identifiable strain within art practice that takes global communication infrastructures as its materials (and to some degree, its subject), virtual as it may have seemed to be, is directly concerned with intercorporeal human connectedness and specific situatedness or emplacement. There is a tendency to attempt to realise the social and political realms of the Internet as mise-en-sens, mise-en-forme, and mise-en-scène. In terms of the kitchen and table as sites for both connectedness and performance, we may also add the chef’s mise-en-place. [t]he commons … are being created continually, and they represent not just a resource to be enclosed and exploited, but a form of resistance that has particular power because it is lived and acted. It’s not at all a contradiction to say that what is common is simultaneously enclosed, exploited, and liberatory. It’s a matter of tipping the balance so that the creation of the commons outpaces their negation. Creative practices under capitalism have long contained elements of creation, resistance (or defence) and détournement, and now these actions, both positive and negative, take place across the digital and situated realms as well as what might now be termed the ‘situated digital’. A number of artists associated with the London-based activist digital arts collective Furtherfield have sought to embody, emplace, and perform ideas, people, and interactions that are at a distance or distributed across space and/or time as well as revealing the social relations that are produced by infrastructures for distribution and connection, including communication and information networks. Furtherfield’s Do-It-With-Others (DIWO) ethos, developed across the web with an international network of artists, technologists and activists – thinkers and doers – has always aimed to enlarge artistic freedoms using the metaphors, tools, cultures and processes of digital & physical networks. It is led by experimental artistic processes rather than utilitarian or theoretical concerns to disrupt traditional hierarchies and concepts of ownership working with decentralized peer 2 peer practices. Its expressions, though initiated across digital networks have often spilled over into physical space. And coming together at table over food and/or drink—commensality and propinquity—have always been understood as an essential part of taking big steps forward in collective endeavour. This was explored most closely through Furtherfield’s Rich Networking Series in which the DIWO approach was employed to discover what digital culture might contribute in the context of ecological and economic stress. The series was a thought experiment about ways of convening artists, curators, technologists, musicians, thinkers and researchers in geographically distant venues to share their knowledge, experience, perspectives and approaches to sustainable international collaboration and exchange. It sought alternatives to the ecologically damaging international plane travel involved in hosting conferences. This paper’s co-authorship exists as part of this ethic, and the process of its writing reflects the need for the sharing of physical as well as digital space in the act of its creation. We had to maintain the conversation during the creation of the paper; we had lunch and the conversation continued through lunch, then we wrote and worked on a web-based document editor, which allowed us to work on the same document together and to access it from anywhere. There is a thrill of recognition and of an oddly physical nearness when you are two authors, blinking cursors, working together at the same time in a document that is precisely the sort of tantalizing almost-touching that is highlighted by Hole-in-Space. But then the need to speak face-to-face reasserts itself again, and dinner is made, wine is drunk, minds and bodies happily together at table and happily creating intellectual work. What this underscores is that, as Jeremy Gilbert observes in analyzing Bernard Stiegler, is that “technicity as such is a constitutive feature of all human culture, that culture itself always takes a technical form, from the very earliest manifestations of tool making or cave art, and that a ‘prosthetic’ relation to technology is partly constitutive of the human relation as such…” Human adaptation through cultural evolution in this context, that of the relationality inherent between ‘nature’ and ‘culture’, and their resultant indivisibility, reinforce the assertion that digital networks and communications cannot be conceived of separately from the rest of material and social existence, and, by extension, nor can the work of art. The authors’ experience in creating this paper is part of the history of Furtherfield’s project to increase opportunities for international ‘rich networking’ by seeking ways to reach into global ideas and associations by creating, through digital means, commensality without propinquity, bringing people as close as possible, allowing their bodies and minds to simulate as nearly as possible the actual experience of dining and creating together. The political and theoretical grounding of these efforts are explored below as case studies from projects of Furtherfield-associated artists involving networked food distribution and dining, including Pollie Barden’s ‘Telematic Dinner Parties’, Sophie Hope’s ‘1984’, and Kate Rich’s ‘Feral Trade Café’. 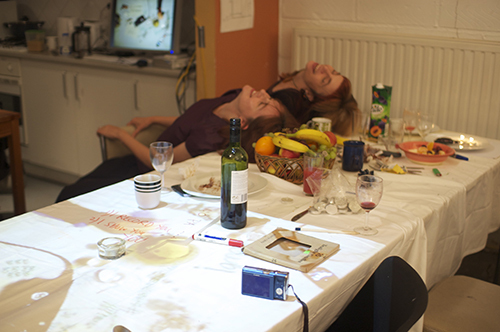 In 2011 Pollie Barden devised a dinner, hosted by Furtherfield as part of the Rich Networking series to support the design of a technology platform that would support remote guests in experiencing togetherness and playfulness within the setting of a conventional dinner party. She wanted to discover how visual and aural channels might be composed to reproduce a dining experience comparable to a traditional co-presence dinner. A live image of remote table-tops were projected down onto physical table-tops left empty for the purpose. The image of the remote plates—first set, then loaded up with food, and eventually (literally) licked clean—occupied an otherwise empty half of a long table next to 4 physical dinner settings. 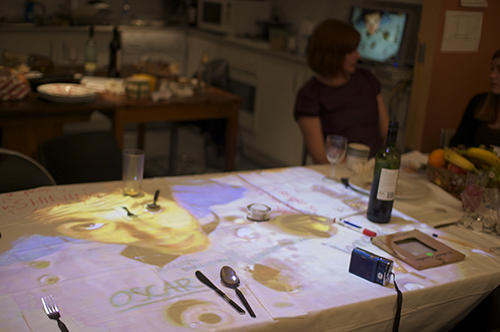 Telematic Dinner Party between Furtherfield, London and Telenoika, Barcelona, by Pollie Barden. Food was served according to the rules of the Latitude Supper club, http://latitudinal.grubclub.com/, from the latitude corresponding to the day of the year. The hosts in each venue cooked a Russian meal. During the later part of the evening participants all observed themselves become more ‘teenagery’—flirty and playful—free from the more careful observances of appropriate attention to ones’ fellow diners. Participants speculated on why this might be. They experienced the technology as inherently rebellious—it just could not be relied upon to behave as intended. The reduction in raw sensory data necessitated risk-taking. Participants had to do more guessing than usual about what their remote guests might mean by their gestures, words, audio expressions. In addition to the disruption of the audio visual signal, the physical set up forced diners to relate to their remote guests via an image projected downwards on to the horizontal plane of the table. Ordinarily guests’ mutual verticality is very much a part of how they relate (perhaps until later in the evening for the more adventurous). The diners “played hard” to compensate for this. The language difference led diners to move to written word—writing messages to each other on paper plates in a form of improvised analogue instant messaging. We deliberately use ‘human-food interactions’ instead of, for example, ‘human-food experiences’ to denote the interconnection between the self and food; food fundamentally influences the self and, at the same time, a person’s actions also significantly influence— beyond individual food choices—the existing food and related systems. J.J. Charlesworth has written accusatorily about the egocentricity of new art and performance (such as Marina Abramovic’s 512 Hours, staged at London’s Serpentine Gallery), where participating in “an experience, being in the now, is the new aesthetic,” but it is ultimately empty narcissism. 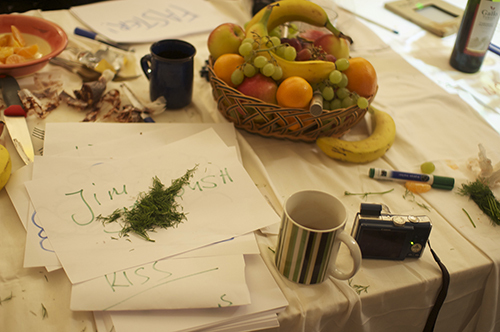 The telematic dinner parties strove to be participatory, transformative, and interactive, building long term relationships and associations through food-centred art practice. As Buttimer and Seamon write, “The mobilities of bodies combine in space and time to produce an existential insidedness—a feeling of belonging within the rhythm of a life-in-place.” In this case two places digitally enfolded into one. “I have been tortured by the experience of simultaneous experiences that we can’t share,” says Sophie Hope. She refers to Jim Jarmusch’s 1991 film Night on Earth as an example; the film’s action takes place in five different cities in five different taxi cabs at exactly the same time, though, of course, the drivers and passengers are unaware of the other stories being played out simultaneously. We discuss how sometimes it is possible to have a too-real sense of violence occurring all at once in the world, and about how we all followed the events of 2013 during the Occupy movement in Istanbul’s Gezi Park as they happened on Twitter, fascinated that the reports and scraps of video seemed somehow more real and immediate than coverage on the evening news. Hope chose the year 1984 as the focus of her interest and activity, a time when, in Britain, a powerful socialist municipal spirit still existed and community art projects and activism intertwined, fertilised by public funding. Artists, activists, and politicians were all aligned, and political structures of the time enabled, for example, the GLC (the then Greater London Council, staunchly leftist, under the leadership of Ken Livingstone) Community Art Programmes which ran from 1981 until 1986. This, though, at the time of neoliberalism’s ascendancy was in stark chiaroscuro against an inky Thatcherite background. Hope staged a dinner in London with British activists who had been highly active in 1984 and whose work continues today. She recorded the conversation during the meal and uploaded it to the web. She has since gone on to organise four further meals in Singapore, Melbourne, Australia, Johannesburg, South Africa, and recently in Montevideo, Uruguay, all with activists with powerful memories of politics in 1984. Singapore dinner, 28 January 2014 at Substation, 45 Armenian Street, Singapore. 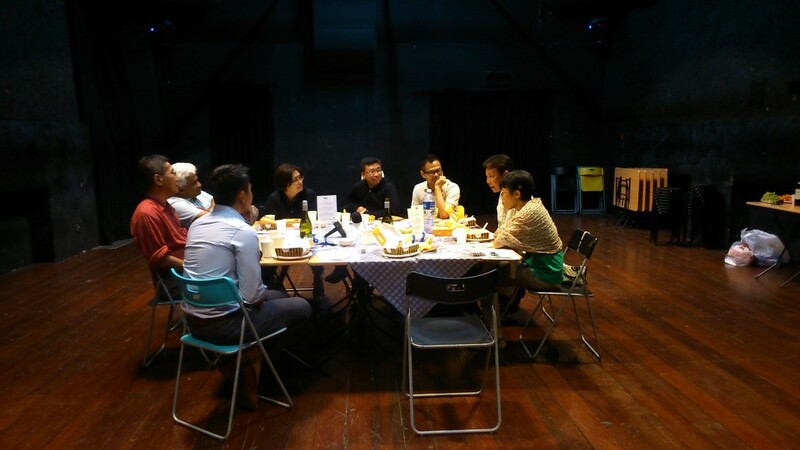 Guests were Russell Heng, Sasi Thiunalan, Jian Hong, Heng Leun, Souk Yee, Suan Tze, and Alfian Sa’at. 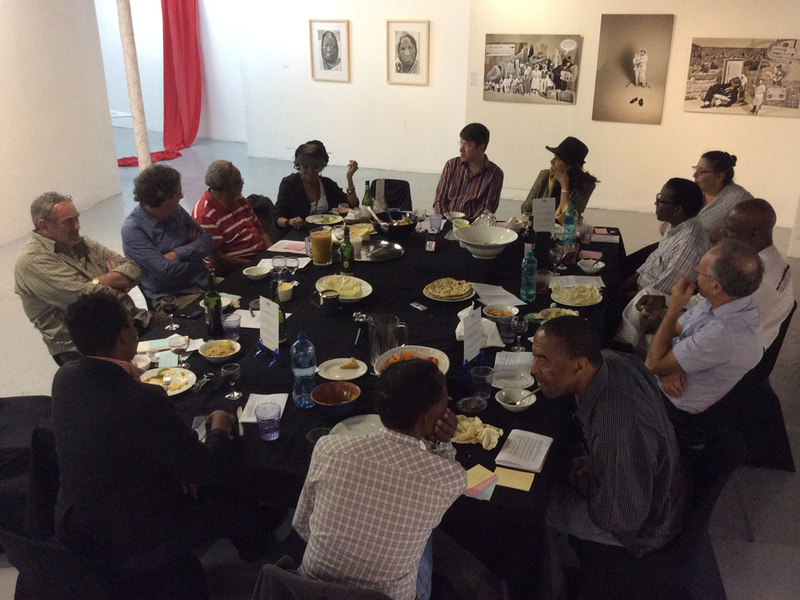 Johannesburg dinner, 20 March 2014 at The Bag Factory, 10 Mahlathini St, Fordsburg, Johannesburg, South Africa. Guests were Firdoze Bulbulia, Anton Harber, Faith Isiakpere, David Koloane, Santu Mofokeng, Pat Motlau, Aura G Msimang, Molefe Pheto, Malcolm Purkey, Brett Pyper, Joachim Schonfeldt, and Monique Vajifdar. Co-hosts were Gabi Ngcobo, Rangoato Hlasane, and The Bag Factory (James French and Sara Hallatt). Together these meals and the conversations during them paint a portrait of a particular time—the sensations, the violence, the exhilaration. By asking participants to recall their experiences together around the table the story and the memories are enriched. The conviviality aids a process of establishing greater veracity in memory, as participants jog memories and reconstruct events. Participants are also ‘kept honest’ by their interaction. The commensality provides a series of failsafe mechanisms that stop participants from rhapsodising, romanticising, or grandstanding in the process of recalling events. In November of 2014, at the launch of Hope’s 1984 website at Birkbeck, University of London, a collage of the recorded conversations was played to an audience seated around a table. Where the 1984 dinners up till that date had involved quite simple meals, (in Singapore, chicken, rice, fruit, and chocolate cake) catered in rather than prepared by the participants, a process which might have diffused the theatricality and formality of the meal setting, the participants were simply served, in disposable containers, wine, crisps, and Twiglets—the peculiar yeast-extract-flavoured snack sticks. In this case, rather than drawing the participants closer to one another, the fact that the foodstuffs served did not constitute a meal served to heighten the exteriority of the experience—that the audience was outside the dialogue from the meals being broadcast and was passively rather than actively engaging with the performance. The transformative interactions of the 1984 dinners had been transformed into an experience. Feral Trade Café by Kate Rich at HTTP Gallery, 13 June – 02 August 2009. Also part of Furtherfield’s Rich Networking series the Feral Trade Café took as its materials, distance, databases and distribution. 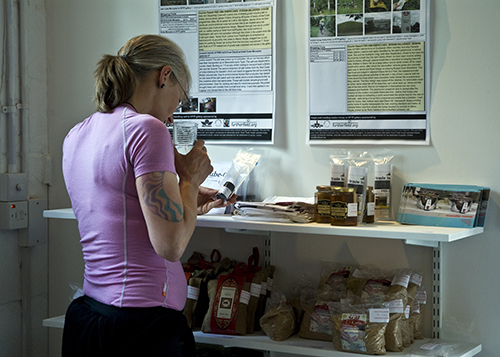 Kate Rich’s artist-crafted database enabled international peer-to-peer distribution of food and drink products (often luxury products such as olive oil, mezcal, chocolate, and coffee) across social networks that took pleasure in subverting the capitalistic use of provenance in the construction of brand narratives. The story of production and distribution of food as told from the ground goes on to reveal also the politics of the places that it moves through. Feral Trade Café was the first instance of an actual cafe. Placemats pulled from the database the ingredients (and stories that attached to them) that constituted the meals that people were served. As they ate, they could read about the producers, and the land through which the couriers traveled. The people who came to the café were both art audiences and lorry drivers who happened to be delivering raw materials and taking away manufactured goods from the light industrial park in which the gallery was then situated. The other people were regular café attendees, the artists and musicians newly moved into the light industrial space (indicating the early stages of this area’s gentrification). It is an artwork that is parasitical on art networks – goods are mainly carried in the spare space of international art networks. It brings the story of provenance AND of distribution and food systems together in a commensal space that encourages a conversation about all of these. The Feral Trade network bears certain similarities to the burgeoning Genuino Clandestino movement based in Italy. Frustrated with corruption in the organic certification system in Italy, and the resultant meaninglessness of the certification, Genuino Clandestino has built a network of farmers and producers who ensure trustworthiness by certifying each other’s products, thus operating entirely outside of European Union or Italian frameworks. Each also contains an insistence upon communal luxury and each showcases that markets outside of capitalist market models are possible and viable. As human beings, we have invented both the street and the table, each staging-grounds for conviviality and cosmopolitanism. In turn, the great isolating and alienating factors in life are inventions: capitalism is an invention, as is the hamburger eaten behind the wheel of a car, the gated community, the privatized digital social network or the smartphone. Technologies and designed environments are assumed to have great agency, but it is the practices of everyday life that more urgently need our attention—those places where technicity and culture intersect. Practices of everyday life, indeed, are being constantly reinvented by a churning media engine driving consumerism, commodity fetishism, and throwaway culture, to add gloss to an already well-burnished set of associations. If lifestyle has replaced or obscured class as the structure around which we arrange our identities, then there is a clear link between the creativity and invention that goes into selling us these lifestyles and the environments and technologies that contain and facilitate them. Thus, it is precisely at this locus that artists must situate themselves in order to effect change and to create the greatest possible use value in the commons. We must invent and sell the lifestyles that we require to save ourselves from isolation and helpless consumerism. We must find ways of performing the cosmopolitan lives that we desire, and by rehearsing them, bring them into the commons of our mutual practice. Furtherfield’s DIWO ethos directly supports this ambition by looking always to support the subversive possibilities opened up for inventive, informal, non-suited, playful, networked communication. It sets out to embrace and explore the whole array of relational wormholes thrown up by the experience of straddling physical and virtual space. Because dinners are such key sites for power-broking and decision-making it would be good to see this developed so that we could imagine non-artists and researchers enticed to play and communicate in this way- changing what gets thought about, decided and acted upon. The interplay of affect, agency, sociality, and conviviality at the dining table provide an ideal model for human fulfilment where profit disappears as a constituent of value, and thus it is perhaps the most critical locus of investigations that strive to be, in Kenneth Olwig’s term, ‘topian’ rather than utopian. That we may find the best possibilities for the future of human habitation and association here, and build models of sustainability that are meaningful outside of the commodifying tendencies of market capital. Toussaint-Samat, Maguelonne. Trans. by Anthea Bell. A History of Food, Second Edition. Malden, MA and Oxford, Wiley-Blackwell, 1987, 2009, p.208. Gilbert, Jeremy. Common Ground: Democracy and Collectivity in an Age of Individualism. London: Pluto Press, 2014, p. 133. Choi, Jaz Hee-jeong. “Introduction” in Choi, Jaz Hee-jeong, Foth, Marcus, and Hearn, Greg, Eds. Eat, Cook, Grow: Mixing Human-Computer Interactions with Human-Food Interactions. Cambridge, MA and New York: MIT Press, 2014. Charlesworth, J.J. “The Ego-Centric Art World is Killing Art” Artnet News, December 30, 2014. https://news.artnet.com/art-world/the-ego-centric-art-world-is-killing-art-197530, accessed 3 November 2015. Buttimer, Anne and David Seamon. The Human Experience of Space and Place, quoted in Cresswell, Tim “Landscape and the Obliteration of Practice” in Anderson, Kay, Mona Domosh, Steve Pile and Nigel Thrift, Eds. Handbook of Cultural Geography. London: Sage Publications 2003. pp. 269-281. Interview with Sophie Hope, 30 April 2015. Hope, Sophie. “Singapore Dinner,” 1984 Dinners website http://1984dinners.sophiehope.org.uk accessed 3 November 2015. Genuino Clandestino’s website is genuinoclandestino.it/ and there is an Italian language film at https://vimeo.com/34322825. Scholar of the commons Massimo de Angelis is currently studying Genuino Clandestino. Also worthwhile, and related as it shows similar problems of the DOC certification system in Italy that parallel the issues found in organic certification, is Jonathon Nossiter’s film about rebel winemakers in Italy entitled Natural Resistance (2014). Olwig, Kenneth. “Representation and Alienation in the Political Land-scape”. In Cultural Geographies 12. London: Edward Arnold, 2005, pp 19-40.